Y’all know that I work hard to come up with good vegetarian things to eat on the regular. The impetus for this wasn’t because I was harboring PETA-esque guilt (although I might be working on a adorability-based scale for which proteins to eat: pigs and cows are the cutest, eat them least; chickens and fish are the least huggable, eat them more) but really because cooking vegetarian is generally cheaper than cooking meat. I think that mushrooms may be the exception though. Mushrooms aren’t exactly wallet-busting, but on my scale of vegetable bargains, they definitely rank low on the list. But they’re totally worth it. I’m not really sure when certain mushrooms are in season, but something about this dish seems really fall-like to me, so I it fits the season if you ask me. I found this recipe in my Cook Like a Rock Star book by Anne Burrell. I haven’t made much in there yet, but the two things I have done – homemade pasta and this mushroom ragù dish – were both terrific. I recommend it especially if you have a bit of dexterity in the kitchen already. Let’s first start off by addressing the dried porcinis. I’ve actually never seen a fresh porcini (that I know of). 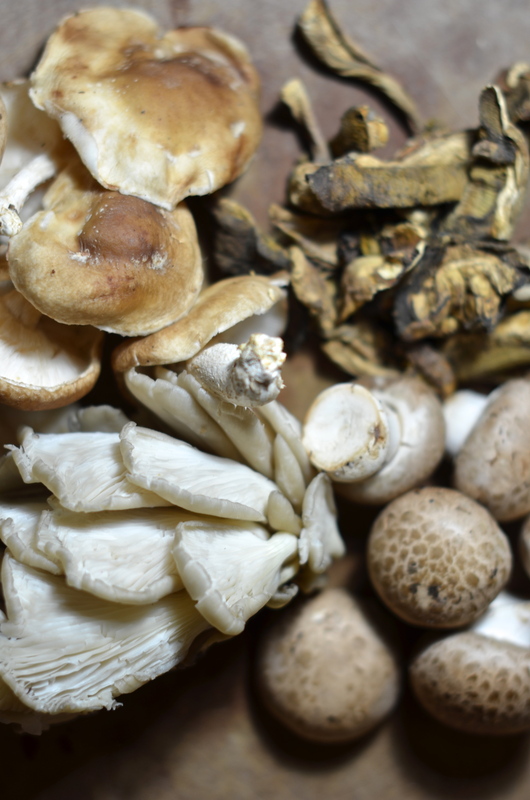 We need to reconstitute them so that the become plump and delicious and so that we create a deliciously concentrated mushroom stock at the same time. In three cups of very hot water, soak the porcinis for about 30 minutes. When the time comes, you’ll be fishing out the mushrooms with your implement of choice all the while saving the mushroom stock and letting the grit from the mushrooms linger at the bottom, undisturbed. Quick mushroom lesson (clockwise from top left): shitake, dried porcini pre-soak, cremini (a.k.a. baby portobellos) and oyster. Before I get anything cooking I take care of the mushrooms because cleaning them can take a bit of patience. 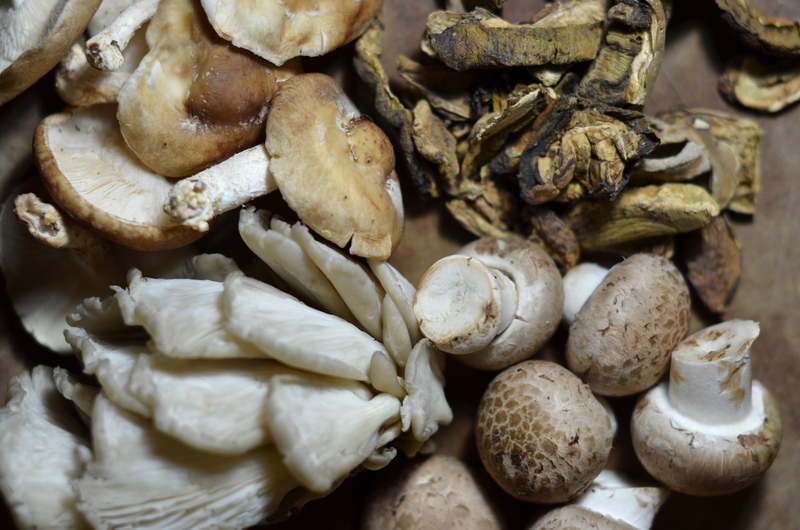 I use a damp paper towel to wipe down the mushrooms and then either pull or cut away any woody stems. Then they get a nice chopping. Now let’s get cooking. 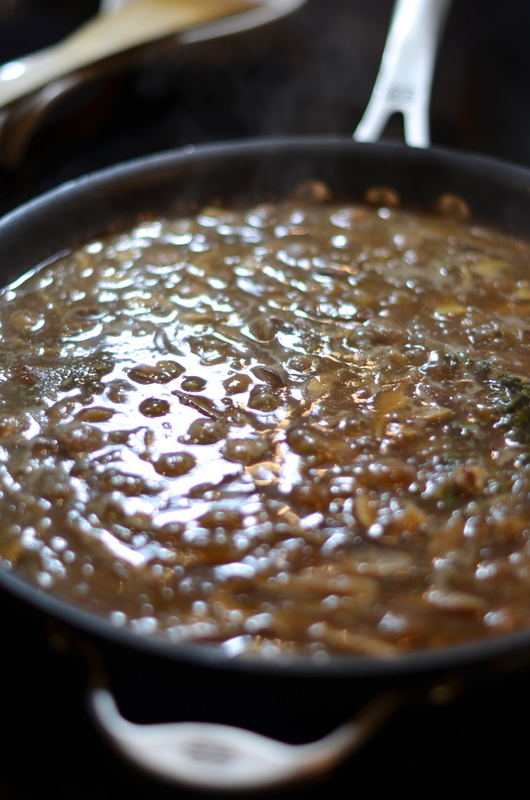 Grab a large saucepan and a couple of tablespoons of olive oil and heat over medium-high on the stove. Dice your onion. 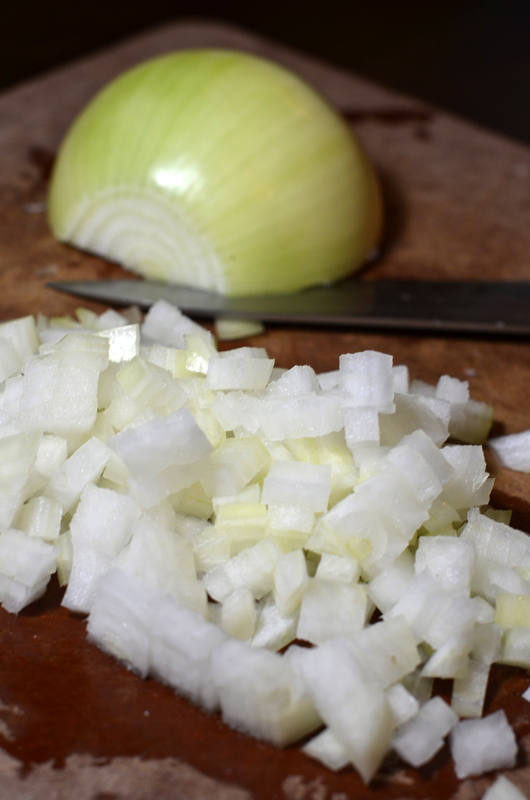 Add the onion to the pan and saute until the onion along with a pinch each of salt and red pepper flakes. Let the onions get nice and golden. 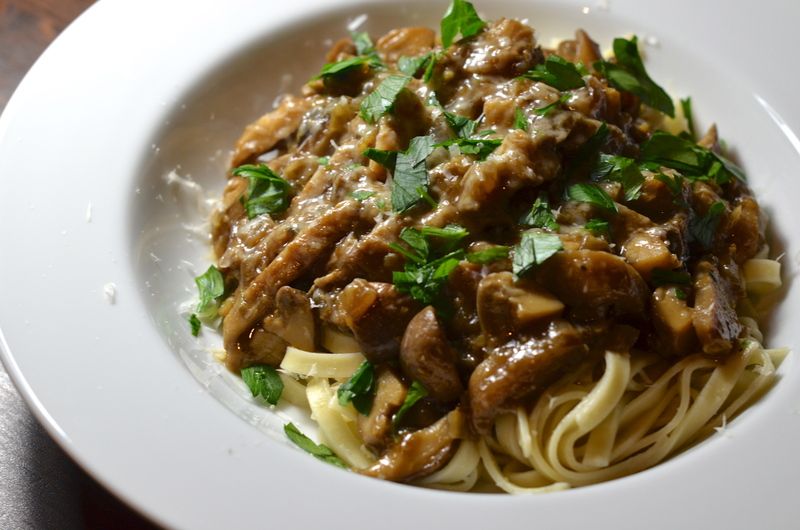 When that happens, add the fresh mushrooms and the white wine and cook until the wine is reduced by half – only about 5 or 6 minutes more. Now it’s time to get creative. Your porcinis should have been soaking for about a half-hour by now. 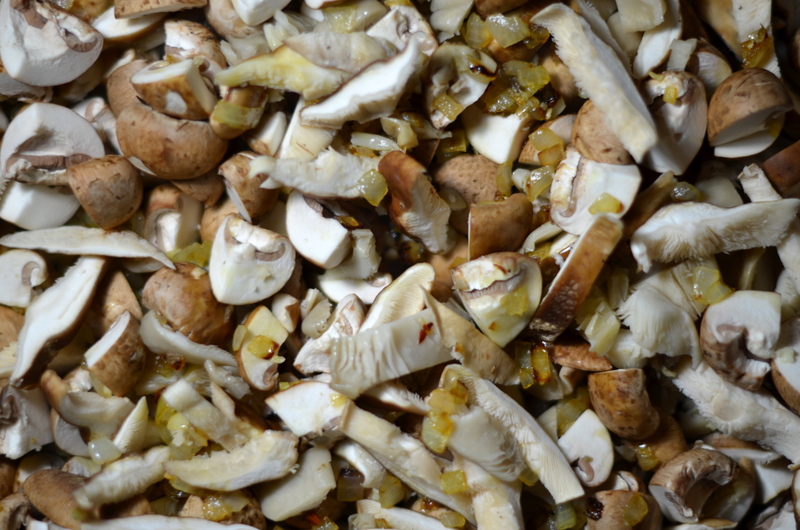 Using your hands, a slotted spoon or something along those lines, fish out the mushrooms and put them in a (mini) food processor. 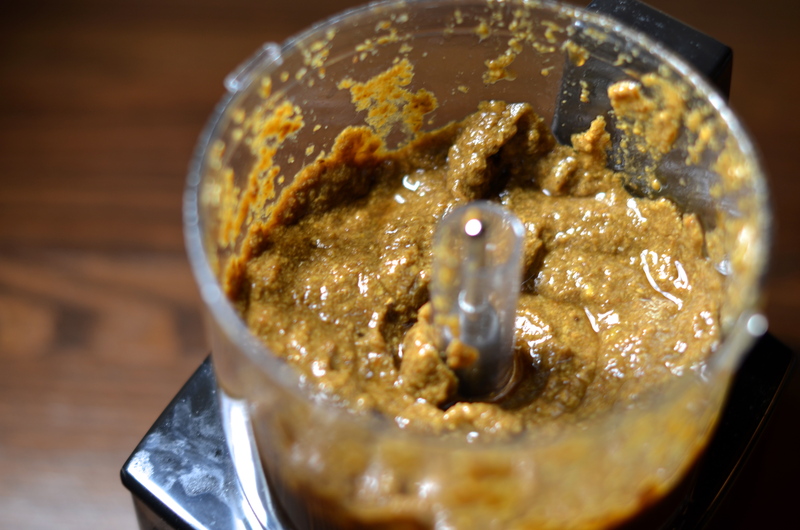 Add 1/2 cup of the porcini liquid and purée into a smooth, unfortunate-looking paste. Go ahead and add the porcini paste, 2 cups of the remaining soaking liquid (taking care not to disturb the crud that has inevitably settled to the bottom of the bowl), 1 cup of stock, thyme and bay to the pan. If you need to, add another pinch or two of salt. You’ll need to. Bring to a boil and then let the sauce simmer uncovered for 30 minutes. You may need to add more stock, but I didn’t. We are notorious for preferring thicker sauces in our home, though. You can serve this on whatever you want: polenta, gnocchi, pasta, other mushrooms. We picked pasta. It was delicious and hearty and I received kudos from the taster. The parmesan and parsley on top are important too. Don’t forget that. This look amazing. Definitely Thanksgiving worthy and something my husband would absolutely adore. Why have I never pureed mushrooms before? Thanks for the inspiration!